The first reason was a selfish one. I was not the first parent to be completely baffled by our badly fractured mental health system. Nor was I the first to have a son become entangled in our criminal justice system because of his mental disorder. I realized that other parents would be the best guides for me when it came to helping my own son. They would understand my fears and the emotional roller-coaster I was riding. They would be able to offer me advice that was based on practical experiences about how things actually worked. I also knew that being involved in NAMI would help me keep my son’s problems in perspective. Oftentimes, when I would feel as if I had hit bottom and was losing hope, I would attend a NAMI meeting and listen to someone talk about what they were going through or what they had achieved. I did not take joy from other members’ pain, but I saw in them determination and hope in the midst of horrific circumstances and their resilience made the obstacles that Mike and I were facing seem less insurmountable. I remember listening to a mother in Miami whose son refused her help and was homeless for 12 years, living on the streets. She drove by him when she went to work each day and often arrived at her job in tears. I remember the two parents in Philadelphia whose only son committed suicide. They were both psychiatrists yet they could not save him. I remember the telephone calls that I received from parents whose sons and daughters were in prison, some on death row, because of crimes committed when they were ill.
At NAMI, I also heard incredible stories of recovery. The wife who had been involuntarily committed more than a dozen times but had been doing well for the past two years and was back with her family. The daughter who talked about how her father had returned to work after battling major depression. The proud parents of a graduate who had recovered from a debilitating breakdown after having been diagnosed with schizophrenia. NAMI became, for me, a Peer to Peer support group. Which brings me to some of the other reasons why I am so proud to be a lifetime member of NAMI. In addition to practical advice and emotional support, NAMI offered me excellent educational programs. Family to Family is a course that helps parents and siblings deal with having a loved one who is sick. In Our Own Voices is a fantastic speakers’ program that puts a human face on mental illness by having consumers deliver positive testimonials that show recovery is possible. Stigma-busters helps educate the media and fight prejudice. Peer to Peer training is helping transform mental health services by giving persons with mental illnesses a strong voice in their own treatment and the recovery of others. NAMI Walks raises much needed money and increases public awareness. NAMI Walks helps take mental illnesses out of the shadows. I am especially proud of how NAMI has reached out to different ethic groups under Executive Director Mike Fitzpatrick’s leadership. NAMI has been active in explaining the importance of understanding cultural diversity in treating mental disorders. And, of course, I can’t mention NAMI programs without talking about its leadership in pushing Crisis Intervention Teams, perhaps the most successful program in America when it comes to bringing law enforcement, drug and alcohol treatment services, and the mental health community together to enact reforms. Having spent 32 years in Washington D.C. as a reporter and at one point covering the U.S. Congress, I understand the importance of having a strong advocate on Capitol Hill and NAMI has been an effective voice there for all of us. It has worked tirelessly to educate our elected officials and it has developed important contacts in local, state, and federal legislatures to fund treatment services that we desperately need. Given its lack of a fat Political Action Committee war-chest, I am amazed at just how well-respected NAMI is in our nation’s power corridors. Of course, NAMI isn’t perfect. None of us is happy about how much of NAMI’s budget comes from big pharmaceutical companies, but I do not know of a single decision that was influenced by drug company contributions. Right or wrong, these donations underwrite many, many crucial programs. When one of my fellow reporters calls me to criticize NAMI about contributions from pharmaceutical companies, I remind them that newspapers survive on advertising revenues, yet the best news organizations keep a barrier between newsrooms and those paying the bills. I see NAMI doing much the same. We also disagree in NAMI, often heatedly, about such emotional topics as involuntary commitment, self-determination, assisted outpatient treatment, the continued closing of state hospitals, and even expanding the role of consumers within our own ranks. But even during the worst of these arguments, when I have stepped back and taken a deep breath, I have realized that everyone in the room feels passionate because they care so deeply about persons with mental disorders. Our hearts are in the right place and that is what bonds us together. I like to say that NAMI is not like the ski club or your local wine tasting group. Few of us joined because we thought, ‘Hey, that looks like a cool group to attend.” But since I became a member, I have made friends with some of the finest persons I’ve ever met and that has been a much treasured bonus. Because of my book, I have been able to visit NAMI chapters in 46 states and the one commonality that I have found is determination. Against some of the cruelest challenges and indignities that life can slap them with, NAMI members pick themselves up, dust themselves off, and like a boxer who doesn’t know when to quit, they stand up and prepare for another punch. We are relentless because we must be. We are hopeful because we believe in recovery. And we are successful because we know that our course is just, fair and right. These are some of the many reasons why I wear my gold NAMI lapel pin proudly and why I am happy that my son’s illness changed me from being a journalist into being an advocate. NAMI is not the only mental health organization that is doing great things. Our friends and allies at Mental Health America and at the Depression Bipolar Support Alliance also offer their members a wide range of services and support. Mike attends DBSA meetings and I speak regularly at MHA functions and have always been impressed by MHA Executive Director David Shern, PhD. But as a parent, NAMI seemed a natural fit for me because it was begun by other parents. If you have a mental illness, love someone with a mental illness, or want to join us in fighting for a better society, I would encourage you to join NAMI, MHA, or DBSA. Thanks for this, Pete. It really explains what NAMI's all about. NAMI's been a lifesaver for me. It took the Family-to-family course, have participated in the NAMI walk this year. In a time of crisis, NAMI helped with information I needed to help get my loved one from jail to the hospital. I saw you speak at NAMI Indiana's convention a while back. I was deeply moved. As a consumer who is an affiliate leader in Kokomo, IN, I can also say that NAMI has changed my life. I don't know where I would have wound up after my diagnosis if I had not found the local NAMI's consumer support group early on. Thanks for being with us, you are a strong voice for us. 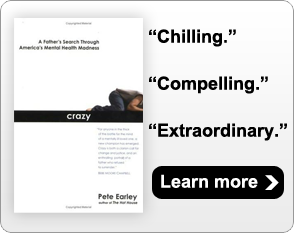 Pete, I'm currently reading “Crazy”. Can't tell you how many times I've heard that my schizoaffective 19-year-old son cannot get help because “He's not committing suicide and isn't killing someone else.” That is “crazy.” I'm looking forward to what else I might find in common or of help in your book. Your blog has encouraged me to join NAMI's Family-to-Family classes and try to get my son to attend DBSA classes. Our lives for the last six years have been a nightmare — hellish. The only thing that keeps us both going is HOPE. May God bless your family as you fight on! A non-authoritative observation: Some things not mentioned about a person's reluctance to join a support group: The feeling that one is overwhelmed with situations to the extent that one doesn't have one minute left over for anything. Also, significantly, the anticipation of joining a group can trigger apprehensions of even more loss of control (to the group or someone in it). The fear of loss of control seems to revolve around feelings that the public institutions are not very helpful (and even seem venal and malicious sometimes) and a person is best served by one's scurrying around in a game of musical chairs for useful resources where there are many players but only a couple of chairs. The totality of this conspires to enable the involved family member to keep isolated. This can even be true for people who have been willing to relax their guard and wind up either with a metaphorically bit hand or disappointments from unrealized hopes. I'm not arguing for these obstacles to participation, just noting their presence.